Mallory and her mother always believed Mallory’s father, Cutter Wilson, died fifteen years ago of natural causes. A mysterious encounter with a former agent and colleague of Cutter’s warns Mallory and her husband, Alton, that it was murder. Very soon after he reveals this information he too is found murdered although on the surface it also appears to be natural causes. Both Alton and Mallory are employed from time to time by Ernesto Vega, Manager of the NSA; Alton as a cryptologist and Mallory as a forensic accountant. They call on Vega to support their investigation into the deaths of both men. The story is full of action and never gets bogged down with too much detail yet is written in a way that the reader enjoys a fast paced ride to uncover the truth. There is plenty of suspense and action dotted with humour and tempered with affection. Their undercover operation takes them to Afghanistan and Australia in search of a company that doesn’t seem to exist. I quickly took a liking to both Mallory and Alton and especially liked the combination of strength, tenderness and youthfulness of Mastana. In fact, all the characters, both good and evil, are well developed. 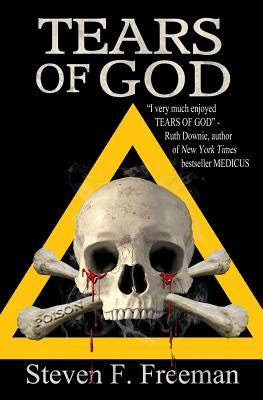 The title of the book comes from a legend that calls for a violent end to those exposed to the tears of God. As an Australian, I feel I should comment on the Australian setting in the book. At the time of writing the author had not visited Australia and I congratulate him for not filling his story with extreme characterisation of scenes, lifestyle and slang that are found in so many non-Australian authored works. Freeman has kept it simple but still conveys the feel of the Australian outback including the high number of venomous animals so suited to the evil Safi’s project. What jargon he has included is spot on and some little-known facts outside the country like, yes; we do have camels in the desert. The interesting fact about our camels is they came originally with traders from Afghanistan. The only mistake is our Southern Cross has five stars, not four. This is the first of the Blackwell Files books I have read and look forward to going back and reading previous stories in the series.